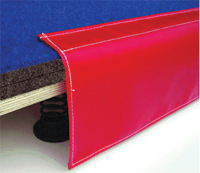 We proudly offer as one of our specialties one of the finest tumble strips available in the US. What makes it so great? Top quality components carefully chosen by years of hands-on research. If you haven't seen how we do floors yet, you can see exactly how it is done here. The net result is a sharp looking, fast and highly responsive flooring that will impress any gym professional. It's unmatched durability provides a true lasting value. And yet, it is available at a very affordable price. T1 - 12' x 42' dual layer (9mm) Baltic Birch decking with American Power Springs and Velcro already attached. 12' x 50' dual layer (9mm) Baltic Birch decking with American Power Springs and Velcro already attached. 12' x 60' dual layer (9mm) Baltic Birch decking with American Power Springs and Velcro already attached. 6' x 42' dual layer (9mm) Baltic Birch decking with American Power Springs and Velcro already attached. 6' x 50' dual layer (9mm) Baltic Birch decking with American Power Springs and Velcro already attached. 6' x 60' dual layer (9mm) Baltic Birch decking with American Power Springs and Velcro already attached. We'll Customize one for you! We offer unique customization at a great price, so if you would like one a little longer or wider, just let us know what size works for you. 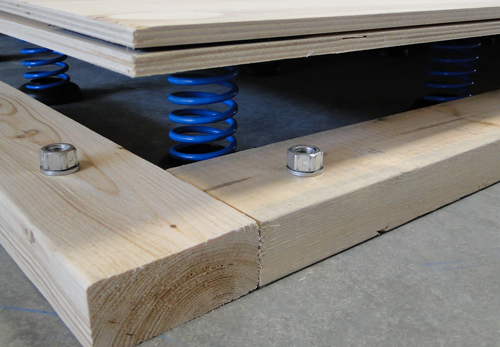 We can make a spring floor in any size (to the nearest whole foot). We would be glad to provide you a quote. Easy to follow instructions are provided, but even with no prior experience, a couple of people can easily assemble the T1 in under an hour. No tools are necessary. Well ... maybe something to cut the bands and remove the stretch wrap of the skids with would be all. First, get your quote with shipping included. You can request pricing by clicking on the link below and filling out a simple form. We will respond with a total (delivered) estimate. If the pricing meets with your approval, let us know by return email or by calling 859-881-0018. After receipt of funds, your strip will be put into production and it should ship within ten days. Available in Royal Blue, Light Blue, Black, Red, Green, Bright Green, Orange, Tan, Yellow, Purple, Pink, Turquoise and Gray.